The Geek Vape LOOP RDA features a one-of-a-kind W-shaped design deck and side-to-bottom airflow. 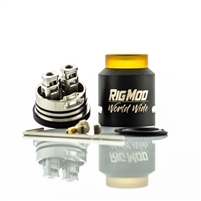 Measuring 24mm in diameter, the LOOP RDA is constructed with four terminals to allow single or dual builds. The Loop's unique design pushes air from the sides downward, then forces the airflow upward through the build deck creating a "surround" flow of air on every pull. Included are a variety of drip tips and bottom feeding compatible gold plated 510 squonk pin.